dark | Happy nom nom nom-ing! How many savory dishes incorporating chocolate have you tasted? For me, I would have to say none before. When I first saw this event I was quite intrigued into how chocolate could be used in savory dishes. Sure I had heard of celebrity chefs using chocolate in their recipes, but I had always thought of that as being ‘scandalous‘ (my boyfriend and my new favourite word)/weird. However, William Blue together with Michel Cluizel and Apromo Trading brought me an evening of chocolate indulgence. “William Blue is delighted to present, in collaboration with Michel Cluizel chocolate and Apromo Trading, an evening of degustation. Tonight explores the myriad of uses for chocolate, and also highlights one of the most exquisite products available in Australia. Now after reading that, I was already drooling. Chocolate for every course? Oh yes! I couldn’t wait for the dishes to arrive. 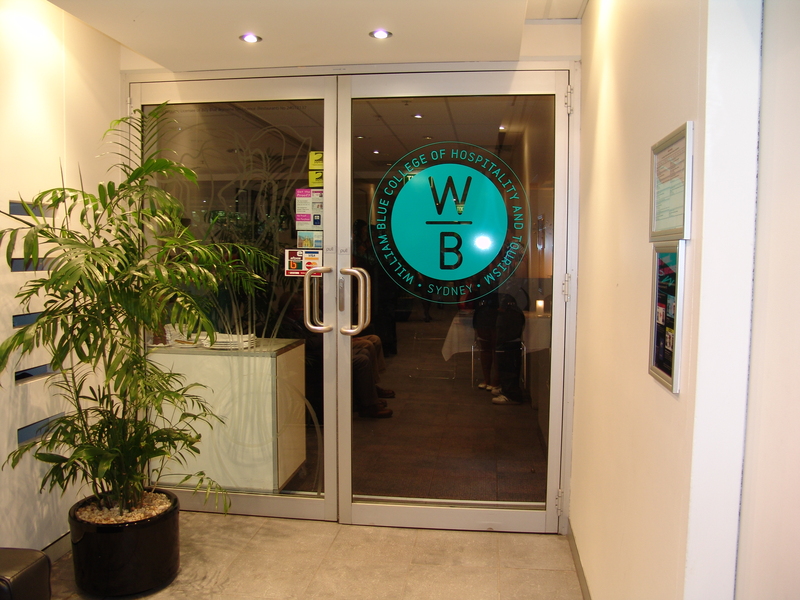 Head chef of William Blue Brasserie, James Ballingall (who I see around William Blue during my breaks) gave us a short introduction into Michel Cluizel’s chocolates and gave thanks to Apromo Trading. I found out that Michel Cluizels chocolates were sold in the David Jones Food Hall, so next time I’m in the area I will go purchase some. I’ve always had a love for chocolate. But it wasn’t until the most recent years where I’ve learnt to appreciate dark chocolate. The slight bitterness really brought an edge to chocolate. The delicate pieces of dark chocolate, slightly sweet but with hints of bitterness from the cocoa, followed by a smooth texture in the mouth made me fall in love with it. I feel like some chocolate now. But I will continue this entry. So the meal began. 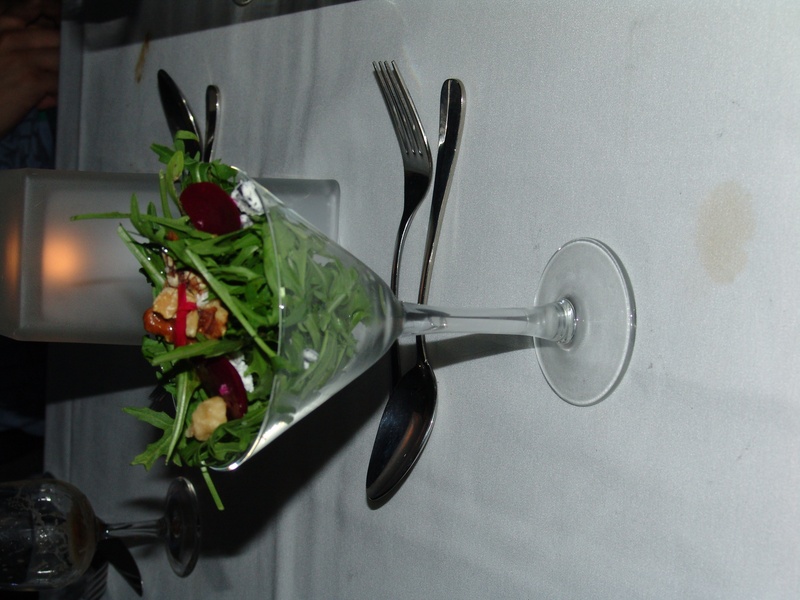 Each dish was accompanied by a wine. The dish is bold and the accompanying wine is underneath each dish. Morel Mushroom and Villa Grancinda tortelloni noisette butter, soured hazelnuts and brussel sprouts puree: The Morel Mushroom was imported from Europe, it’s quite a meaty mushroom. It did indeed feel like I was eating meat. The chocolate was very subtle and only a slight hint of bitterness was present. 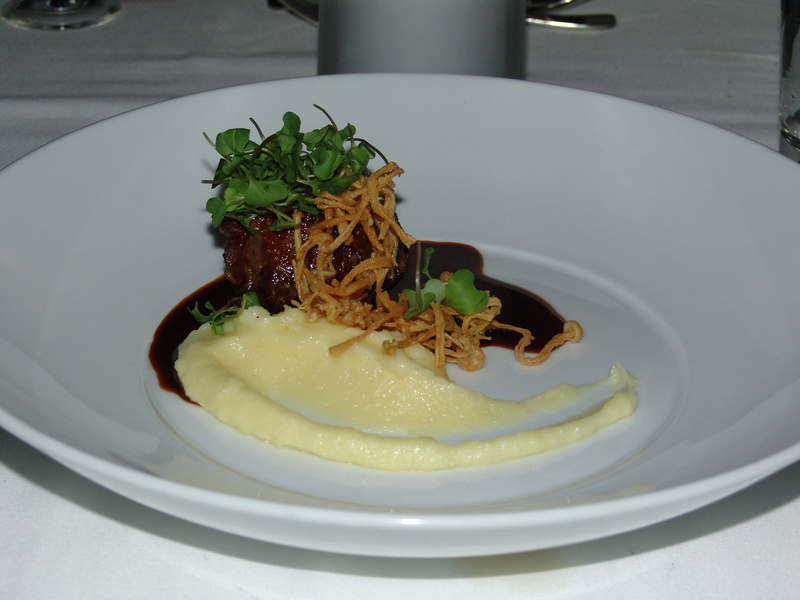 Double chocolate carbonnade of beef cheek, roasted garlic pommes purees, crisp enoki mushrooms: The beef was so soft. You didn’t need a knife to eat it all all. It was weird how I could taste both the chocolate and the beef but they just complimented each other so well. It wasn’t too rich either. I could’ve eaten another serving it was so nice. Mangaro dark chocolate and King Island cloth matured cheddar ‘truffles’, black pepper lavosh, macerated apricots: Personally, I don’t like cheese and I don’t eat it. I have this thing where if I eat dairy I get really sick. I think it’s lactose intolerance but I can drink milk in tea. But since the cheese was covered in chocolate I had to try it. It was absolutely delicious! You first can distinctly taste the chocolate, then when the chocolate has all gone, the saltiness of the cheese comes through. It didn’t taste like cheese at all. It was so *drool*. I might try and make something like this. 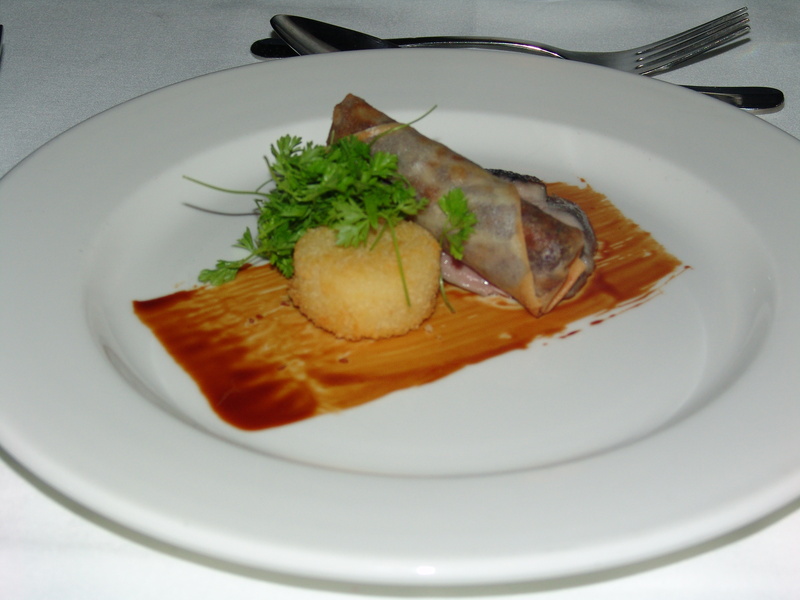 Smoked breast of duck, Concepcion and port glace, black cherry and confit leg springroll, arancini natura: The duck was smoked with earl grey which I found quite interesting. But I don’t really like any dishes that have a ‘poo smear’ on it. 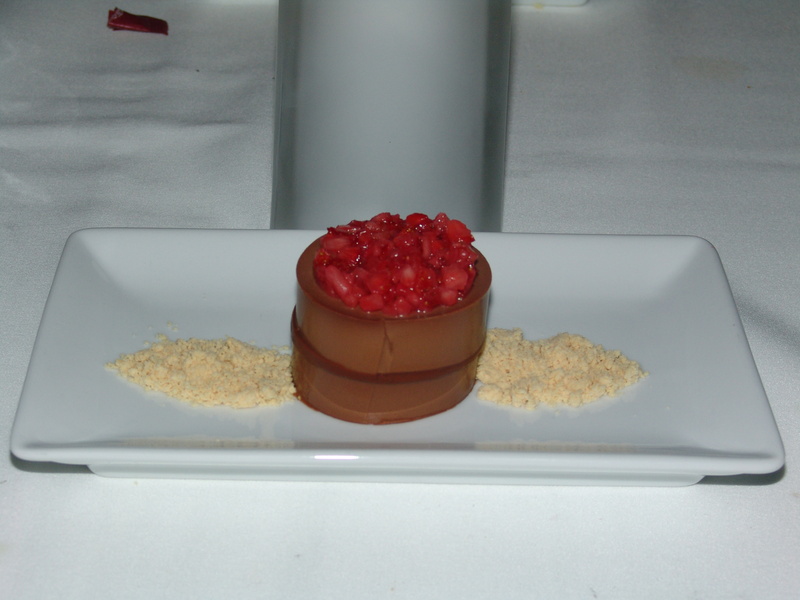 Mangaro and Maralumi milk creme tian with peanut butter soil and strawberry concasse: So so so delicious! 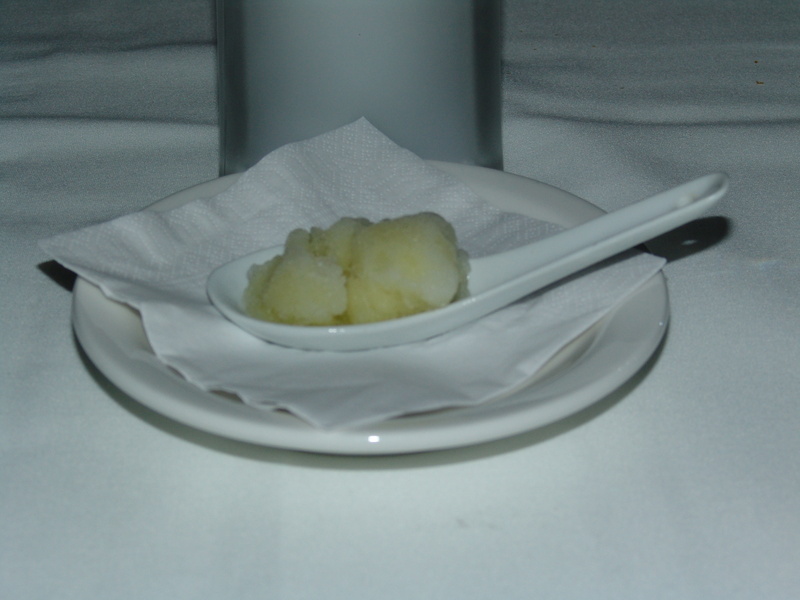 It was kind of like a panna cotta, but more dense. It was made with Madagascan milk and dark chocolate. 2 layers of milk chocolate tian with a thin layer of dark chocolate in the middle. Although it was quite dense, you’d expect it to be quite rich and heavy. Yet is wasn’t. It went down a treat. The strawberries on top also helped to cut down on the sweetness of the chocolate. 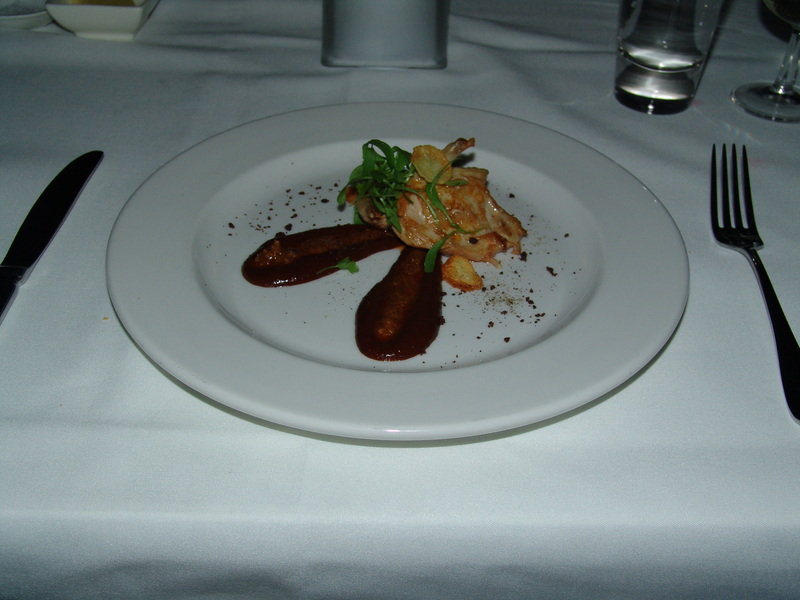 And the peanut butter soil, which looked like breadcrumbs provided the nuttiness to the dish. 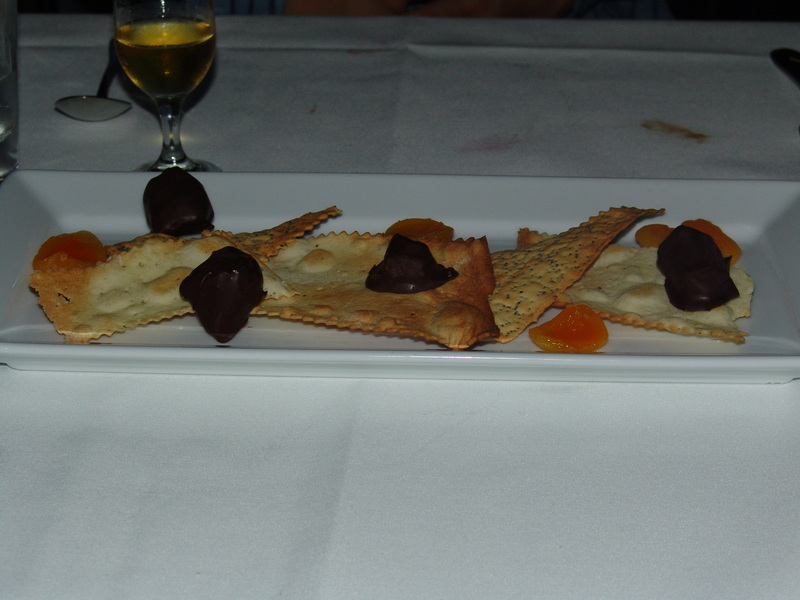 Of course in a chocolate degustation, the dessert has to be the best dish and indeed it was. I think if I see the head chef around I will ask him how he made the tian. Absolutely delicious! De Bortolli ‘Noble One’ Botrytis Semillon, 2007: It was quite sweet but they didn’t give us much so it was perfect. According to my best friend Lemon, I have good taste as this is once of the better dessert wines. I think I’ll try and find a bottle next time I’m in a alcohol store. The boyfriend loved the Young’s Double Choc Stout so I gave him mine as well. I’m not much of a wine drinker, but I did take a sip of every wine that was offered. Apart from the dessert wine with I guzzled down. During the meal I was messaging my friend Richard, who was supposed to come but was complaining that the menu didn’t sound appealing enough. He was having korean hotpot with his girlfriend and was saying how much cheaper his meal was. Eventually I got the boyfriend to send a message saying: “From the author of happynomnomnom: It’s not about the price, it’s about the symphony of flavours in the mouth. It’s about the whole experience of the meal.” Unfortunately I didn’t get a reply from him after that. The overall experience of the meal was excellent. The service was great. The food was delicious. The ambiance was quite romantic and comfortable with the dim lighting. And I didn’t find the meal too expensive. $99 for an 8 course meal with matching wines. 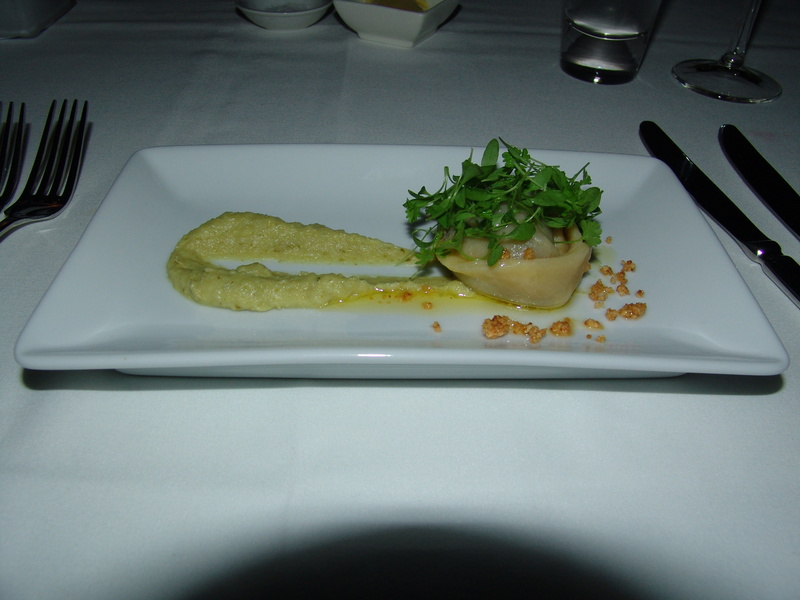 According to the head chef, this was the beginning of a series of degustations that will be happening at William Blue. I hope there is so I can try more new and exciting things. After dinner at Zia Pina last night. 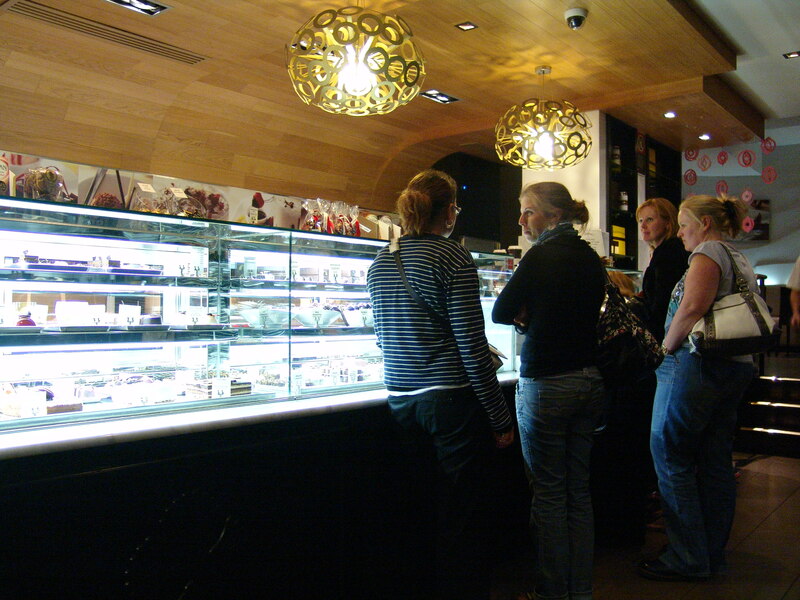 The boyfriend, Richard and I headed next door to the Guylian Belgian Chocolate Cafe. The boyfriend and Richard were talking to each other and completely walked past the cafe. I, on the other hand, was more excited and stopped to looked at the menu. We stepped inside and I felt like a little kid in a candy store (or in this case, chocolate store). It was so beautiful. 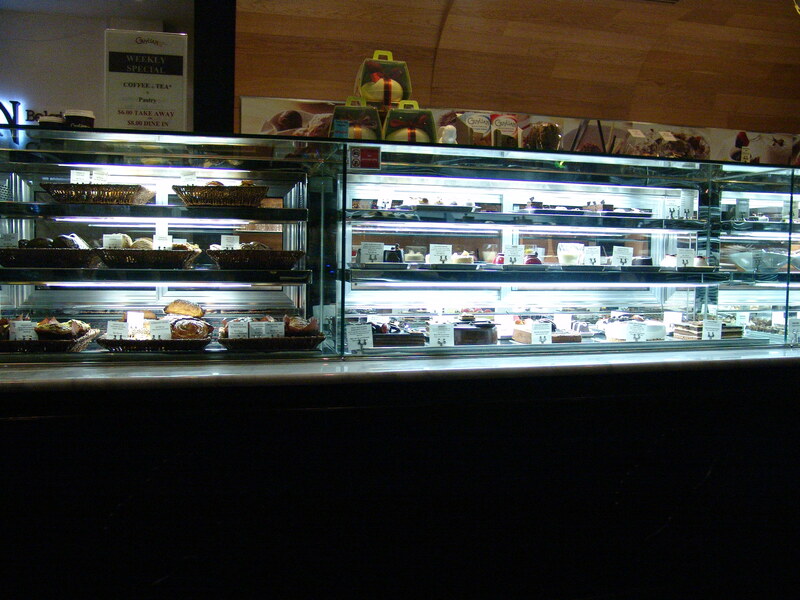 The cafe was brightly lit and I could see rows and rows of cakes and pastries. The manager sat us down quite close to the cake and pastry display. I was so happy. The manager was quite nice in explaining their specials of the day and giving a description of what it was. It sounded yummy! But I was so happy just to be there that I allowed the boyfriend and Richard to choose something from the menu. 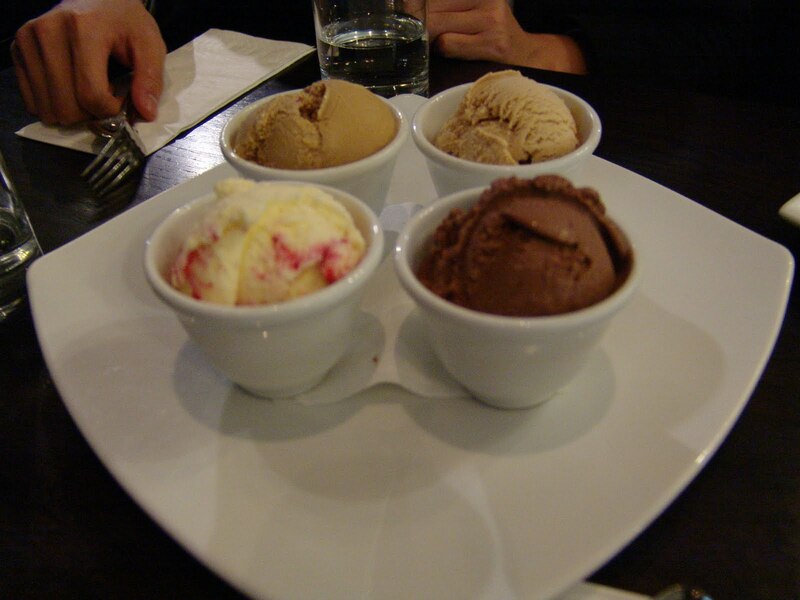 They both agreed to order the Ice Cream Taste Pallet and the Chocolate Degustation Plate. 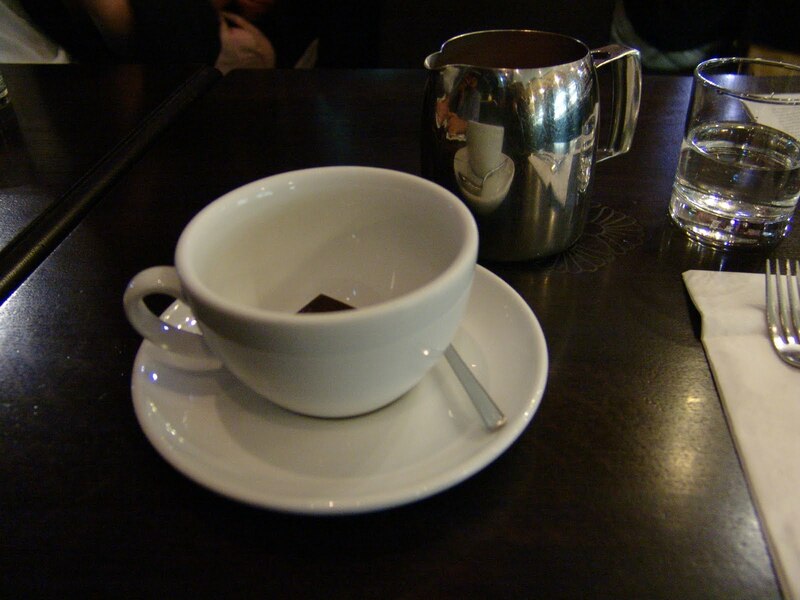 First came the dark hot chocolate that came with the degustation plate. There was a piece of dark chocolate in the cup, but the hot chocolate tasted and smelt like powdered drinking chocolate. Next came the Ice Cream Taste Pallet. We each had a taste of all the flavours and agreed on which was was our favourite and we stuck to it. I had the chocolate, the boyfriend had the praline and Richard had the white chocolate & raspberry. We shared the espresso one. Finally what we had all been waiting for arrived. 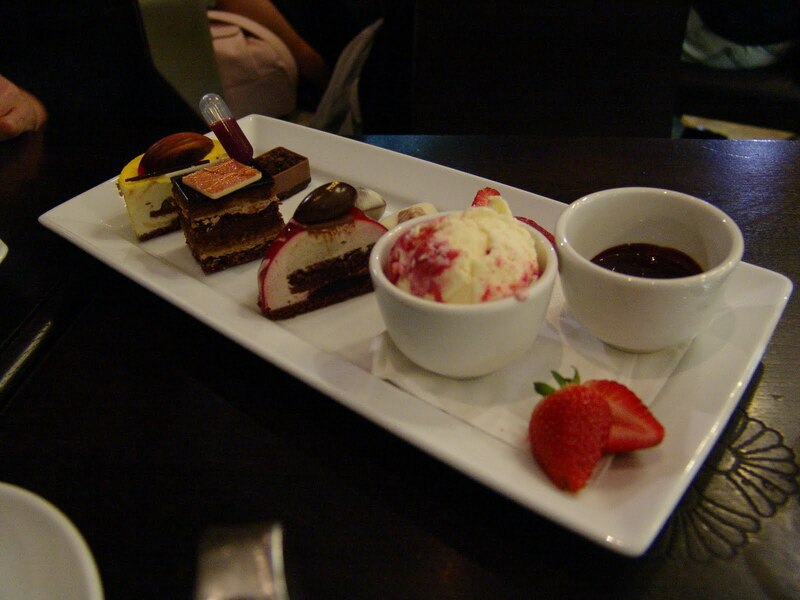 The Chocolate Degustation Plate. It looked so deliciously yummy. So delicious that we didn’t know where to start. We nibbled away at the trio of chocolates first. Then we moved from left to right on the plate. They were all so gorgeous. I could see a couple walk by our table and the woman stopped to look at what we were eating. I love it when that happens because I do the exact same thing when something catches my eye. We were so full after eating dessert that we didn’t really mind the walk to the car. 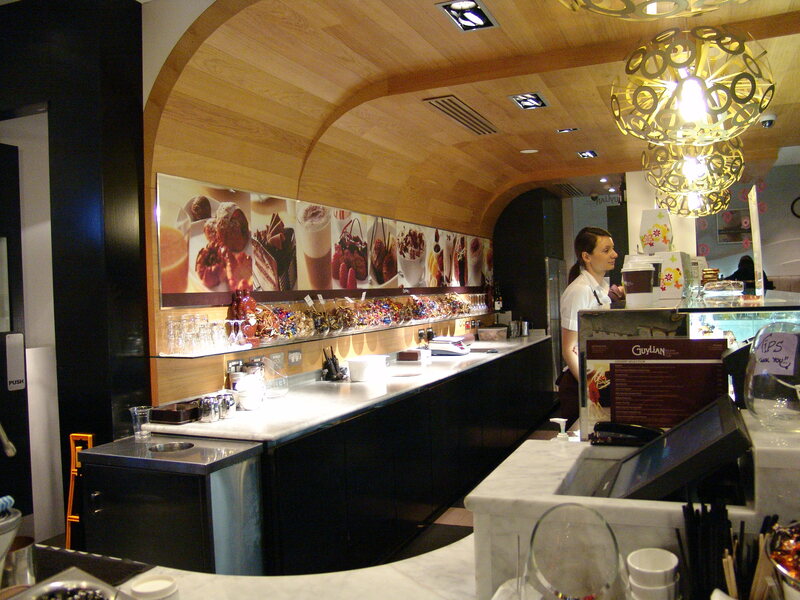 Overall I had a great experience at the Guylian Belgian Chocolate Cafe. I will indeed go back for another treat in the future. Although it was a little bit pricey, I thought it was well worth it for the combination of food, service and ambience. It isn’t the most value-for-money meal but I thought it was well worth it. Pop in for a little snack if you have a sweet tooth.